Further Jordan archeological tour organised for Society members in November 2018. 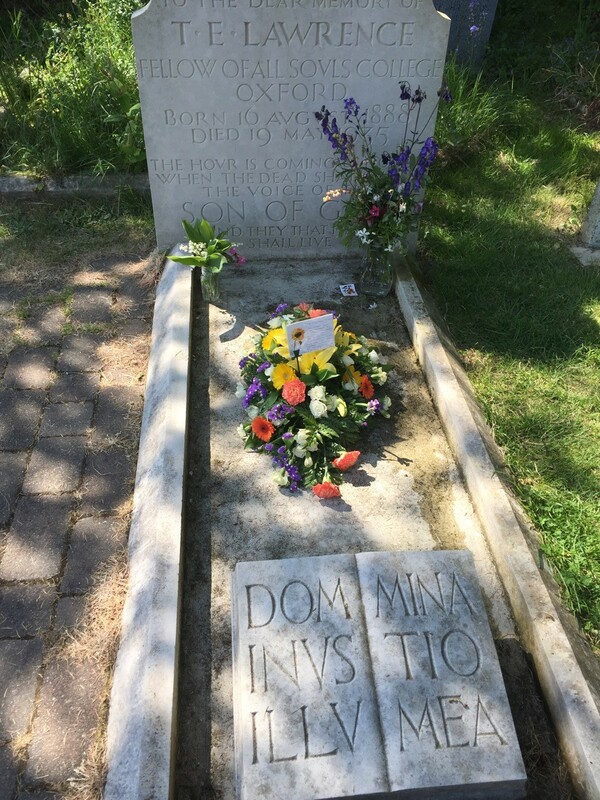 At 11 am the wreath as seen in the photo a generous donation from an American friend – was placed on the grave of T.E.Lawrence. There was a reading from the Seven Pillars of Wisdom where T. E.Lawrence acknowledges his many colleagues who also helped in the Arab revolt. In addition, another friend read another passage from the same source. This was followed by a reading giving us the details of the last day of Lawrence’s life which ended on May 19th at around 8.20am. The wreath was in situ after 10 days thanks to friends of the Society ensuring there is plenty of water for the flowers. The other flowers came from volunteers at Clouds Hill and have now gone. The Mineral Sites Plan for Bournemouth, Dorset and Poole has recently been published (March 2018). Some of these sites proposed are very close to Moreton and Clouds Hill and representations were made by the Chairman and the Society Dorset Group in December 2017, expressing concern at the possible affects and damage in these peaceful parts of Dorset. Having been formally submitted, the Mineral Sites Plan and Waste Plan will be subjected to an independent examination to be conducted by the Planning Inspectorate. This is likely to take place in June 2018, and the Society will be represented at the hearing. The Mineral Sites Plan identifies specific locations for sand and gravel, crushed rock, ball clay, Purbeck Stone, other building stone and a site for the provision of recycled aggregates. The Waste Plan, once adopted, will establish the vision, objectives and spatial strategy for the development of waste management facilities in Bournemouth, Dorset and Poole up to 2033. The Waste Plan contains thirteen site allocations for new and improved waste management facilities to meet the needs of Bournemouth, Dorset and Poole. In addition, the Plan contains a series of detailed policies that will be used when determining future planning applications for waste development. The submitted Plans are unchanged from the Pre-Submission Draft Mineral Sites Plan and Waste Plan December 2017. In addition, a series of submission documents and additional background documents have been submitted. The dates for the tour this year will be 9th-18th November 2018, and the itinerary will be very similar to that of last year, with a couple of minor changes for practical reasons, largely to give us more time in some places we felt we needed it. The tour will be led by Neil Faulkner and Roger Ward, military archeologists from the Great Arab Revolt Project. More detail and programme for the tour can be found in the attached pdf. The Society is saddened to announce that Malcom Brown, died on 7th December 2017, after a long period of illness. Malcolm will be remembered by many members, who will have met him and enjoyed his contributions to past symposia. Malcolm was the co-producer of the important BBC television documentary on Lawrence from 1962. Malcolm, formerly a scholar of St. John’s College, Oxford, also helped Julia Cave produce the BBCs 1986 T. E. Lawrence documentary. He had close links with the Imperial War Museum and wrote and edited several works about the First World War. His Lawrence-related publications include A Touch of Genius (with Julia Cave, 1988) and T. E. Lawrence (British Library ‘Historic Lives’ series, 2003). He also edited The Letters (1988), and Secret Despatches from Arabia (1991), and contributed to several of the Society’s symposia and the Journal. 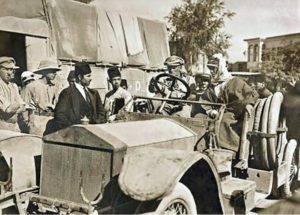 5 July 2017: A joint US/UK team of historians – including several members of the T. E. Lawrence Society – has uncovered the identity of Lawrence of Arabia’s Rolls-Royce – the car in which he was photographed entering Damascus 100 years ago at the culmination of the Arab Revolt. The iconic photograph of Lawrence, taken in Marjeh Square in Damascus, Syria, shows two weathered British officers and a worse-for-wear Rolls-Royce. For decades, the identity of that vehicle has been a mystery to historians, Lawrence scholars and car enthusiasts. nical analysis, the team has identified the Rolls-Royce as chassis number 60985, built in 1909 at Manchester, U.K.
archives, war diaries, factory build records, family letters and other documents, they tracked down the descendants of the owner of the car when requisitioned by Lawrence in Cairo. The discovery has also unearthed official documents and parts of the car unequivocally proving its identity. Though the vehicle itself has not yet been discovered, it is estimated that, if found, “Blue Mist” would be one of the most valuable cars in the world. Behind the Lawrence Legend: the Forgotten Few Who Shaped the Arab Revolt, is scheduled for publication by Oxford University Press in February 2018; Tom Clarke, a Rolls-Royce historian who has published numerous books and articles on the marque; and R. Pierce Reid, who runs a vintage Rolls-Royce restoration shop. His recent Norwich University master’s thesis, For I Can Raise no Money by Vile Means: T. E. Lawrence and his Relationship with Money, Debt and the Historical Record, was published in The Journal of the T. E. Lawrence Society, Vol. XXIV, No. 2. 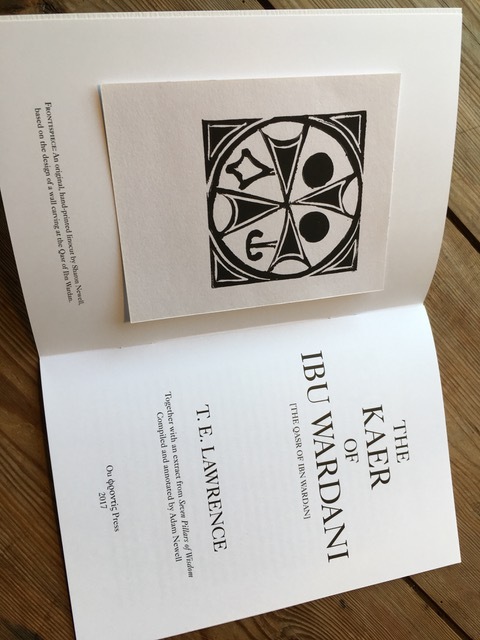 T. E. Lawrence Society Journal. 2 April 2017: Jeremy Wilson, the authorised biographer of T. E. Lawrence, has died following a period of illness. Jeremy was widely regarded and respected as the leading scholar and authority on Lawrence. Together with his wife Nicole, he established Castle Hill Press which has published fine-print editions of many of Lawrence’s manuscripts and letters. Journal and the biennial Symposia. He will be greatly missed by all in the Lawrence fellowship worldwide. 30 March 2017: Lawrence’s silver-gilt dagger – presented to him by Sherif Nasir after the taking of Akaba in July 1917 – has gone on public display for the first time since it was saved from export last year. undergone a £23.75m redevelopment project. Museum and National Portrait Gallery – until being put up for auction at Christie’s in 2015, when it was sold to an overseas buyer. After the Department for Culture Media and Sport put an embargo on its export, the dagger was saved for the nation when the National Army Museum stepped in to match the £122,500 auction price with the help of a £78,400 grant from the National Heritage Memorial Fund. 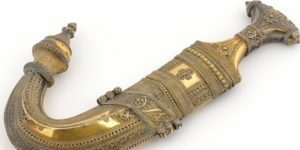 The dagger, together with a set of Lawrence’s Arabian robes and a headdress, can be seen in the Army gallery at the newly reopened museum. Entry is free. For more details see the museum’s website HERE. The Society will be asking the Secretary of State for Culture, Media and Sport to review the decision. Oxford City Council, eminent historians and many residents of Oxford had supported this opportunity to officially recognise Lawrence’s family home as a cultural and historic asset to the City of Oxford. directly manifest in the house”. In the 13-minute interview, Alan and Liz explain why the house and Lawrence’s garden bungalow are worthy of the special protections that Listed status would bring. 2 Polstead Road, Oxford, as a Building of Special Architectural or Historic Interest. The Society applied for listing in 2015 after the occupier’s death led to concerns that the house and garden bungalow – as well as a number of original artefacts, including a cupboard door marked with the heights of the five Lawrence boys as they grew to manhood – should be protected. bungalow in the back garden where he could carry on his studies. It was as an undergraduate at Jesus College, Oxford, that Lawrence undertook his studies of Crusader castles that brought him First Class Honours. At the Ashmolean Museum in Oxford, he became friends with the archaeologist David Hogarth who was his mentor in his subsequent careers in archaeology and British Intelligence, where his role as adviser to Emir Feisal in the Arab Revolt of 1916-18 led to him becoming known to the world as Lawrence of Arabia. After the First World War he was made a Fellow of All Souls College, Oxford, to give him time to write his book about the Arab Revolt, Seven Pillars of Wisdom. together submissions from historians and architects in the UK and US, reflecting the international interest in Lawrence – we emphasised how 2 Polstead Road is steeped in historical associations with Lawrence. Indeed, visitors from around the world still come to see the house where Lawrence grew up and was photographed in the garden playing with his brothers. 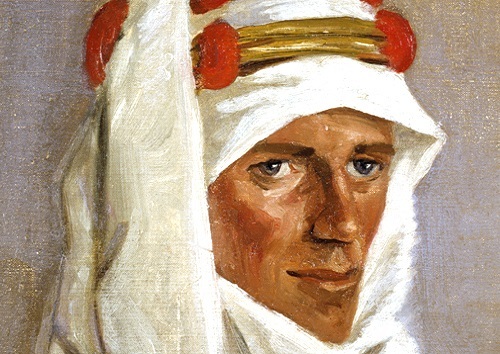 We are therefore disappointed – and bemused – to read Historic England’s opinion that “although doubtless of some influence on the young TE Lawrence, the national historic interest of Lawrence is not directly manifest in this house” and that alterations to Lawrence’s bungalow have “denuded” the historic association with him. Society having provided photographs of the cupboard door showing the boys’ heights and other artefacts. We are saddened that Historic England and the Secretary of State have missed an important opportunity to protect the house and bungalow as an asset to the City of Oxford. We would point out that Lawrence’s birthplace at Tremadog in North Wales, where he lived for one year as a baby, is Grade II listed despite fundamental alterations to convert it into a hostel. Lawrence’s cottage at Clouds Hill, Dorset, had its listing upgraded to Grade II* in December 2015. Lawrence’s grave in the cemetery at Moreton, Dorset, is Grade II listed. The Society would like to thank Elizabeth Wade, the local City councillor in Oxford, Robert Franklin, a Quondam Fellow of All Souls College, Oxford, and Society members Alan Payne, Joe Berton, Charles Eilers and Nick Lynch, who all contributed to the submission, as well as all the people of Oxford who supported us. To read the Secretary of State’s decision in full, click HERE. The Society now has 28 days from 13 January 2017 to request that the Secretary of State reviews the decision.